INSIDE : See the easy steps to create a gorgeous Brushstroke Wall Paint pattern in your home! It’s simple to paint and so much easier than applying wallpaper to your space for a fun accent idea. 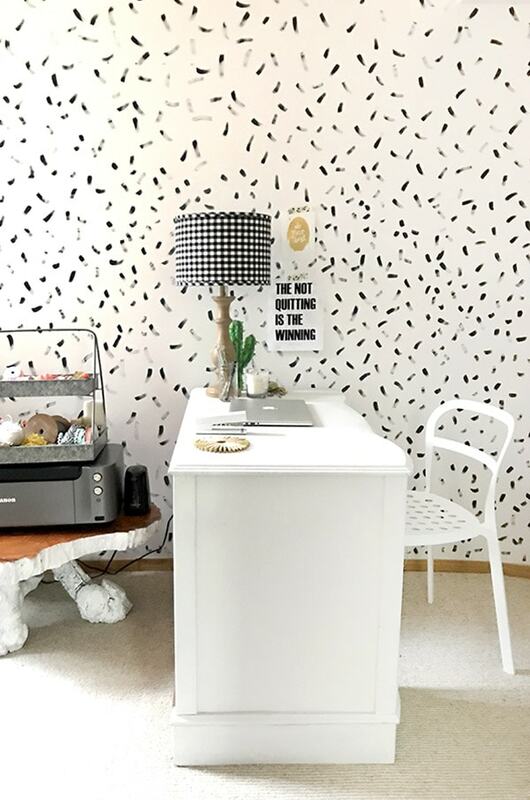 About a month ago, I shared about my honest thoughts on using an Interior Paint Sprayer in my office. Now that my office had a nice clean coat of paint on the walls, it was time to bring in some personality to the space! 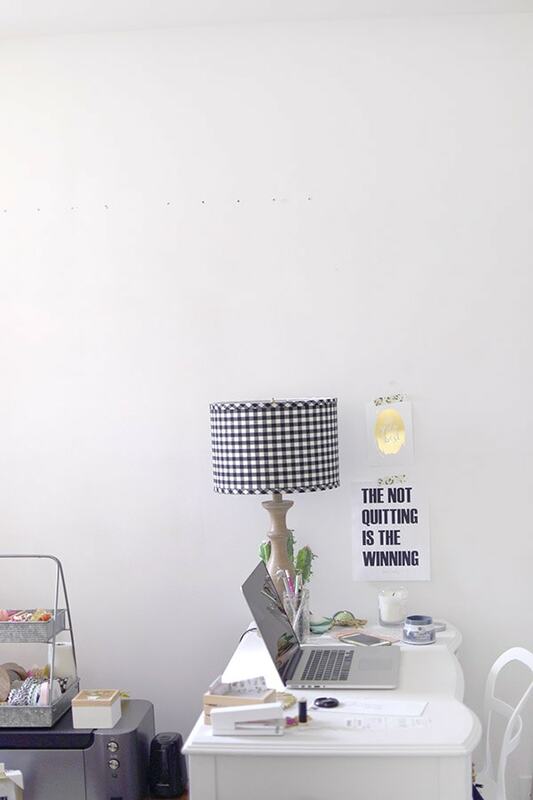 I have pinned so many fun ideas for wall treatments and was having such a hard time narrowing it down. 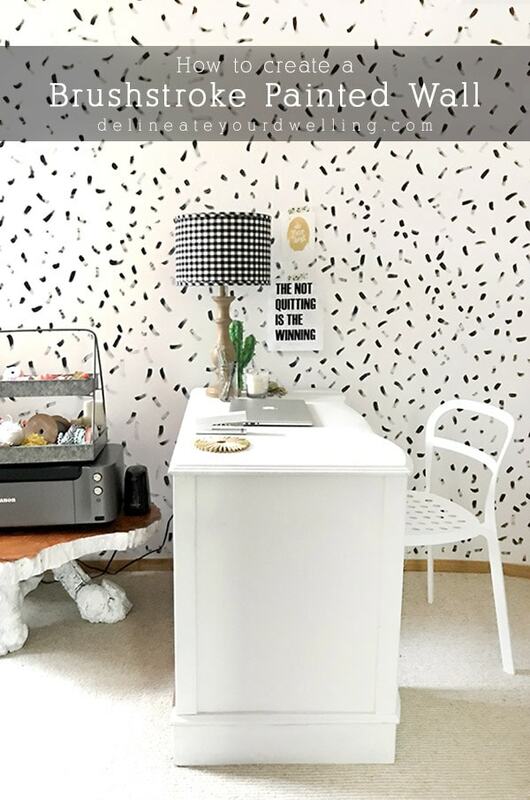 I am so excited I ended up with a simple brushstroke pattern and today am sharing how you too can create a Brushstroke Painted Wall in your home. Okay, let’s first take a look at the room prior to getting started. The walls were crisp and clean and white… and a little too plain for my liking. 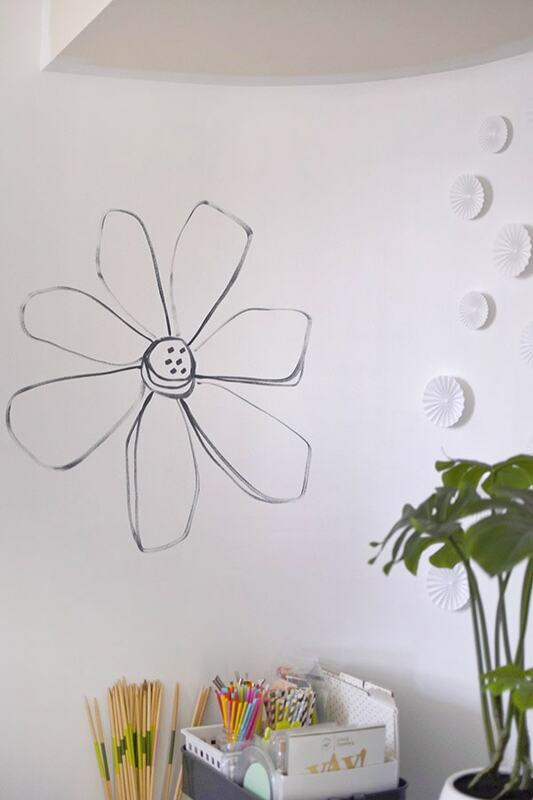 At first, I decided to paint a huge floral wall. I grabbed my paint which was a dark navy charcoal color and went to town. I did two flowers and decided to have the look I would want with a floral wall pattern, it was going to take forever and I did not have the patience to do that. So, I grabbed my spare white paint I had and painted RIGHT over those flowers. 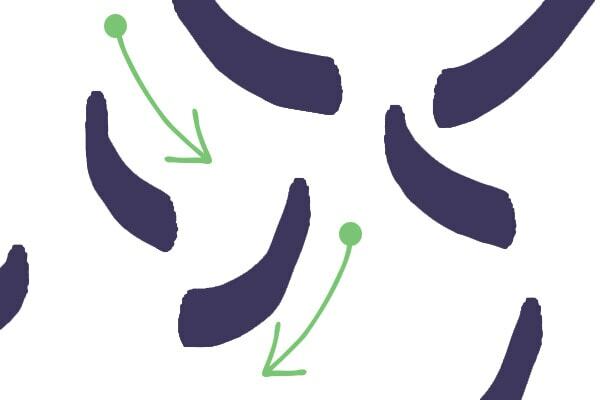 After letting it try, I got going on my fun brushstroke pattern! Here is a quick diagram of how I painted this simple wall painting design pattern. 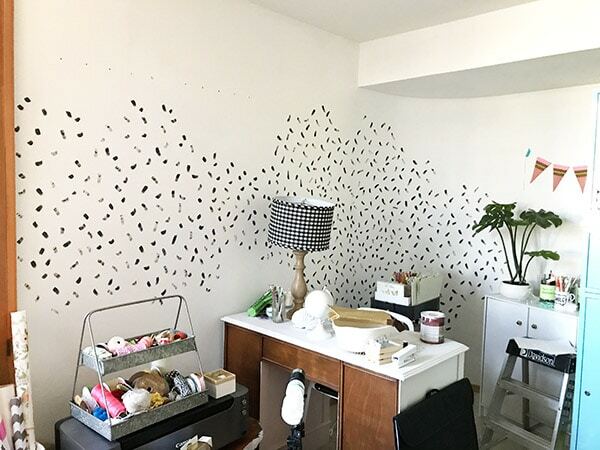 The beauty of painting a brushstroke pattern wall is you can interpret this design any way you like! There is really no wrong way. You can see I just slowly moved around the room with one continuous path. I then went back with a ladder and did the upper portion of the wall and then did the lower portion. 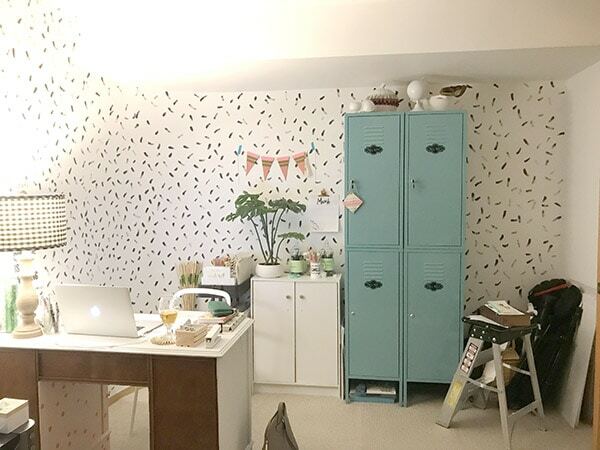 Also note, the wall I did has a curve right behind my desk (it’s a bit of an optical illusion)… so it’s technically two walls that I painted. 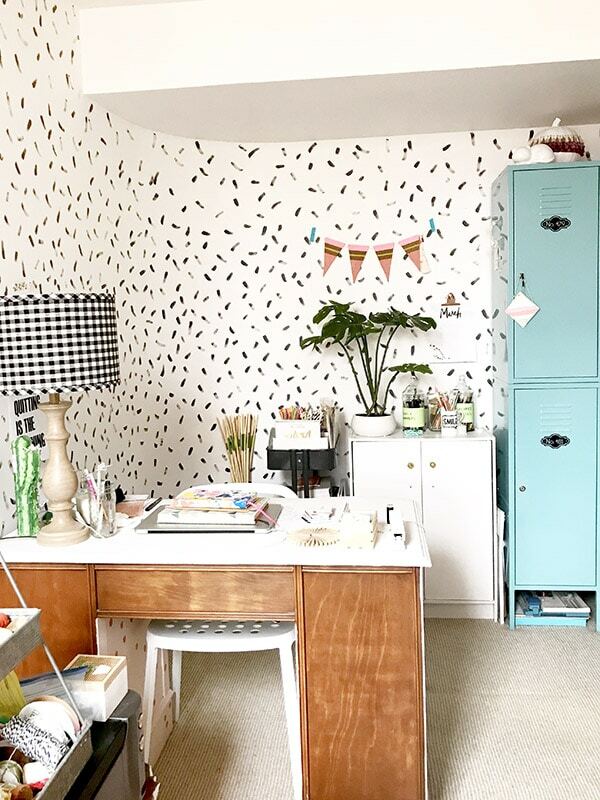 But I love how this accent wall paint pattern idea really gave such personality to the room. I think if you painted an entire room with this pattern, it would feel overwhelming. However, just painting these two walls and having the other two walls still all white, it feels like a fun accent wall without being too over powering. You might also notice that this was is a far cry from perfect. If you have been following along with Delineate Your Dwelling for long, you will know that although I like things to be done well and done correctly… perfectionism is not something that is high on my priority list. Some areas of the wall have a more dense brushstroke pattern than other areas. Some areas I “swooshed” to the side more than other areas. Guess what, I don’t mind at all. PLUS! I will be sharing the creative gallery wall that I hung on this main wall in a few weeks and once I had pictures and art on the wall, you could not even tell there were inconsistencies. I love the pop of pattern this painted brushstroke design brings to my space. I love that as soon as I tire of it, it’s as simple as painting over the pattern. Compared to the efforts of removing wallpaper and cleaning the wall, this brushstroke painted wall wins BIG in my book!!! I love the look of brushstrokes – looks very natural and artistical. Thanks for the tips! Thanks so much! It’s brought a fun look to the space.